This entry was posted in Essays & reflections and tagged 24 Days, anti-Semitism, balance, brotherhood, film, France, Halimi, immigration, Jews, Muslims, North Africa, teaching by The Viking Jewess. Bookmark the permalink. I’ll be most interested in hearing your students’ reactions. It’s a viciously difficult film to watch, though I am agreed with you that it’s important – essential, even – because as you note, Ilan Halimi was targeted because he was a Jew. In my home community, there’s an active and enthusiastic anti-Israel/anti-Jew flavour on some university campuses (our fastest growing demographic has been Muslim immigrants, whose numbers have grown more than 35% in the past decade or so). I cannot imagine showing the film in a classroom which included Jewish students whose voices are often silenced by their Muslim classmates and some anti-Israel professors. 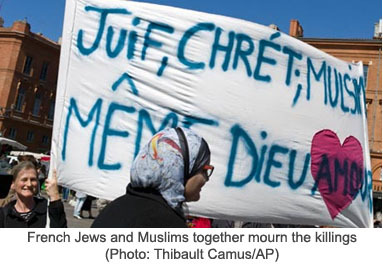 Several years ago, a Muslim Zionist (which seems as odd to write as to read!) visited my city, to talk about how he, once an avowed Jew hater, had changed so dramatically. He was shouted down by Muslim students, who even approached him up-close. Security was called, and the event was cancelled. This is our environment. And this is why it’s so important to do what you’re doing. Hei – leste en bok for mange aar siden, tror det var en bokklubb bok. “Med livet foran seg.” Oversatt fra fransk, om en arabisk gutt i paris og en joedisk dame. Varm bok. kanskje jeg leste den for foerti aar siden? Fin artikkel i Lilith Magasin! Gleder meg til aa lese mer. Så hyggelig at du likte artikkelen. Vi skal lese den boken på det kurset også. Det er en klassiker! Og den er helt nydelig. Merci Christer, c’est gentil de m’envoyer ce lien.